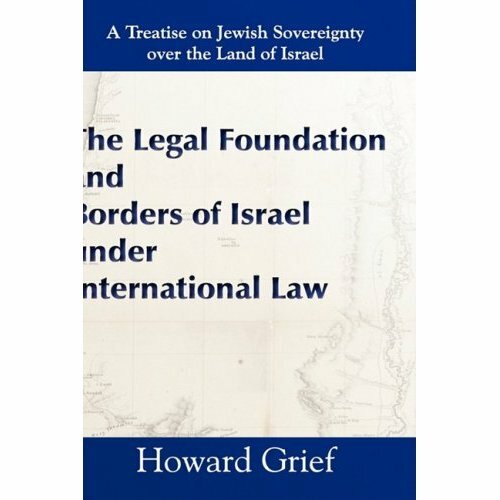 With The Legal Foundation and Borders of Israel under International Law (Mazo Publishers, Jerusalem) Canadian-born Israeli constitutional scholar and lawyer Howard Grief has given us a book that shatters every myth, lie, misrepresentation and distortion employed over the 61 years of Israel's existence to negate the sovereign rights of the Jewish People to their national home. It is a lengthy treatise  660 pages plus a 50-page appendix  but the Jewish people's long and tortuous struggle to retrieve their stolen patrimony deserves nothing less than full disclosure. Anyone who has ever been at a loss to counter the slanders and calumnies that are the stock in trade of the Israel-bashers and anti-Semites on both the Left and Right will treasure every one of its 20 illuminating chapters. Rooted in the premise that the best antidote to a myriad of small and medium sized fabrications is the exposure of the whole cloth from which they've been woven, The Legal Foundation lays bare two dominant myths that have shaped popular perspectives on Israel. The first is the fallacy that Jewish sovereignty over the land of Israel was the joint product of the 1947 United Nations Partition and the May 15th, 1948 termination of the British Mandate for Palestine. In fact, as Grief points out, Jewish sovereignty in Palestine had been validated under international law 28 years earlier. "The legal title of the Jewish People to the mandated territory of Palestine in all of its historical parts," he informs us, was first recognized on April 24, 1920 when the post-World War I Allied Supreme Council (Britain, France, Italy and Japan), meeting in San Remo, Italy, "converted the 1917 'Balfour Declaration' into a binding legal document." How "binding" may be construed from the fact that its wording gave effect to the provisions of Article 22 of the Covenant of the League of Nations and became incorporated into the Mandate for Palestine. Indeed, the "San Remo Resolution," within which the Allied Supreme Council's decision is contained, constitutes what the author terms "the foundation document of the State of Israel, the legal existence of which is directly traceable from that document." That the Jewish People were unable to exercise their sovereignty in Palestine for 28 years  it being assigned to the British Mandatory power as their de facto agent  did in no way detract from their de jure rights to the land under international law during that interregnum. In this thesis, Grief is ironically supported by both a passionate Zionist, U.S. Supreme Court Justice Louis D. Brandeis and one of Zionism's most implacable opponents, post World War I British Foreign Secretary Lord George Nathaniel Curzon. Brandeis believed that with the passage of the San Remo Resolution, the debate over who owned Palestine was effectively over. Curzon called the Resolution the "Magna Carta" of the Jewish People. From the initial misattribution of Jewish sovereignty in Palestine to the 1947 Partition Plan rather than the 1920 San Remo Resolution, it was just a hop and a skip to a second major misrepresentation of Israel's international legal status  the erroneous assumption that the Partition Plan and the May 1948 termination of the British Mandate somehow erased the Jewish People's rights to Palestine in all its historical parts and dimensions enunciated at San Remo, and implemented under the terms of the League of Nations Covenant. Those "parts and dimensions" were defined inter alia, as including the northwestern portions of the Golan and most of present day Jordan by the "Franco-British Boundary Convention" in Paris. The presumptive cancellation of those rights, Grief submits, is thoroughly discredited by "the principle of acquired rights," codified in the 1969 Vienna Convention on the "Law of Treaties," and the "doctrine of estoppel." The first, he asserts, insures that "the fundamental rights of the Jewish people did not lapse with the international process [the San Remo Resolution] which brought them into existence. The second further guarantees that these rights cannot "simply be abrogated or denied by those states which previously recognized their existence." Taken together, they provide what the author terms a "definitive answer [to] anyone who claims that Jewish legal rights and title of sovereignty over all of Palestine and the land of Israel did not continue after the end of the Mandate for Palestine...except in the allotted boundaries of the UN Partition Plan..."
Noteworthy among the states that wholeheartedly endorsed Jewish sovereignty over Palestine in all its "historical parts and dimensions" was the United States of America  the same U.S.A that today regards Israel's presence in Judea and Samaria as an illegal "occupation" of lands upon which it favors the creation of a Palestinian State. The Obama administration and the Bush administration that preceded it are either unaware or have chosen to be unaware of the fact that the 1924 Anglo-American Convention on Palestine made the U.S. a "contracting party" to the Mandate, further reinforcing a unanimously passed Joint Resolution of the 67th Congress two years earlier, signed by President Warren G. Harding, recognizing a future Jewish State in "the whole of Palestine." It needs to be borne in mind, Grief notes, that the Mandate for Palestine that was ceremoniously incorporated into U.S. law in 1924 "was a constitution for the projected Jewish state that made no provision for an Arab state and which especially prohibited the partition of the country." Thus, he concludes, the fierce exception the U.S. has taken to Jewish communities in Judea and Samaria and its unremitting pressure for creation of a "Palestinian State" amount to a repudiation of its signature to the Anglo-American Convention on Palestine. It is in violation of American law and America's obligations under international law. The Legal Foundation and Borders of Israel under International Law is the product of 25 years of independent research by Grief, a former adviser on international law to the late Professor Yuval Ne'eman, Minister of Energy and Infrastructure in the Shamir government and the father of Israel's nuclear energy program. It is the kind of seminal work that seems destined to become both an indispensible source for defenders of Israel's rights under international law and a mirror on the events and personalities that transformed a November 2, 1917 letter from British Foreign Secretary Lord Arthur James Balfour to Lord Lionel Walter Rothschild into the trumpet call that awakened Jewish nationhood from a 1,900-year coma. The author's unsparing portrayal of France's opposition to the creation of a Jewish state at San Remo and, when thwarted, its efforts at the Franco-British Boundary Convention to confine it to the narrowest geographical limits, should dismiss any notion that French anti-Zionism began with De Gaulle. By the same token, the Zionist sympathies attributed to Winston Churchill by Martin Gilbert and other historians withers in the face of the 1922 "White Paper" attached to his name as then Colonial Secretary. Grief offers irrefutable evidence of its having not only "negated" the Jewish state in Palestine that the Mandate "required" of Britain, but of having elevated "Arab pretensions and aspirations to such an extent that everything thereafter became muddled...subject to continuous disputes as to what was really intended in the Mandate for Palestine." For the actual authorship of that document and the wreckage it made of the original plan for the establishment of a Jewish state in all its "historic parts and dimensions" under British tutelage, we have Herbert Samuel to thankâ€"the same Herbert Samuel who worked closely with Chaim Weizmann in the Zionist Organization and was later to pack it in for a "Lordship" and an appointment as British High Commissioner to Palestine. In ironic contrast, Lord Curzon, Balfour's successor as Foreign Secretary, who "detested" the idea of a Jewish state, put loyalty above personal feelings at San Remo and Paris in arguing manfully for the realization of Prime Minister David Lloyd George's vision of a Jewish state comprised of all its ancient Biblical territories. On the Jewish side, nobody comes off better in this saga than Brandeis, who Grief portrays as "the only Zionist leader...who properly understood the natural consequences of the legal recognition of the Balfour Declaration embodied in the San Remo Resolution." Had Brandeis headed the Zionist Organization, the author believes, "there is little doubt that he would have successfully halted Britain's gross violation of its [Mandatory] obligation ...to rebuild the Jewish state." At the end of the day, it was Menachem Begin who provided the most heartbreaking counterpoint to Lloyd George's vision of a Jewish state reconstituted in most, if not all of its Biblical parts, Grief submits. Begin, national Zionism's anointed champion, bearer of the torch lit by Herzl and passed to Jabotinsky, not only failed to make Israel constitutionally whole by annexing Judea, Samaria and Gaza (as he was expected to do), but in what the author describes as an act of "unimaginable folly," brought to the Knesset in 1977 a plan to establish Arab "self-rule" over those critical portions of the Jewish estate. In so doing, he opened the portals wide for their identification as "unalloted," "disputed" and finally "occupied" territories. Nine months later, in September 1978, Begin crowned his "achievement" by injecting the "self-rule" proposal into the negotiations with Egypt at Camp David, offering to leave the final determination of sovereignty over Judea, Samaria and Gaza to their inhabitants and "local representatives." Thirty one years later, Israel remains bedeviled by that fateful decision. William Mehlman is Americans for a Safe Israel (AFSI)'s representative in Israel. Howard Grief's book is sold on Amazon and at Barnes & Noble. This article appeared in the October 2009 issue of Mideast Outpost (http://mideastoutpost.com/archives/000590.html).